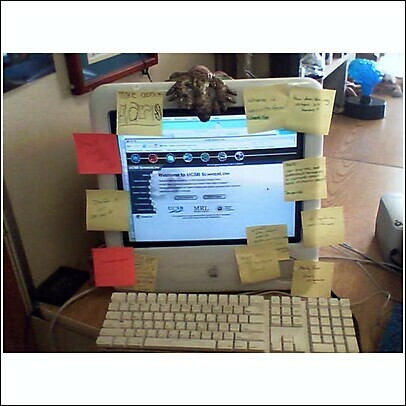 This image represents one week's worth of post-its. Each post-it note is handcrafted by a student needing something from me or, more likely, having a question we were not able to answer in class. I treat student questions very seriously, as I believe curiosity is essential for science. If I don't know the answer to a question, it ends up on a post-it note. From there, we use a variety of resources to unearth the answer (our favorites being HowStuffWorks and Ask a Scientist). All of the answers end up taped to my classroom door, and some make it to my other blog. 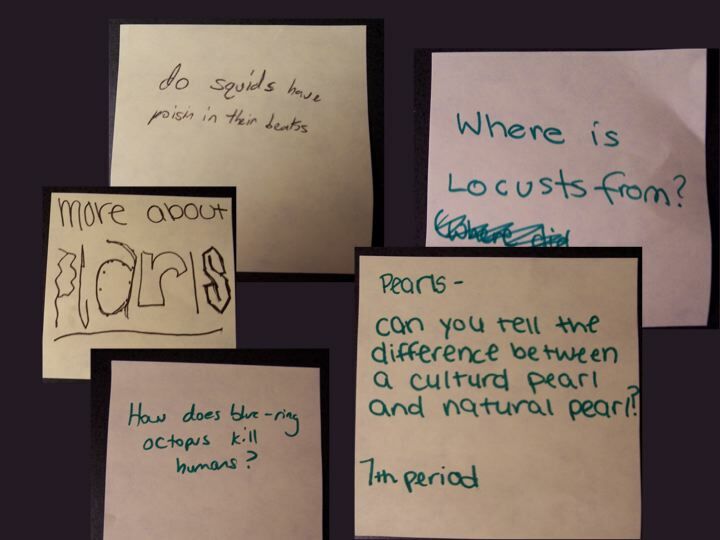 Not only do I enjoy seeing students learn more about a subject, but I also think it is powerful to show that their questions are valued and worth pursuing. This week's door features an article on Chicago's proposed 150-story twisted tower, questions about the hand boilers on my desk, a description of banana slug's odd mating rituals (slug link is PG13 for mild language and invertebrate sexual content), and lots of answers to questions about cnidarians (my favorite: Can jellyfish sting each other?). Now, I realize "ponderings" is not a word that you will find in the dictionary. But since improvisation is a middle school survival skill, an invented word like "ponderings" should raise few brows. The definition of ponder (verb) is "to reflect or consider with thoroughness and care." I'd like to think that my teaching is full of thoroughness and care. By adding -ing to the end of the verb, one forms the present participle of a verb, concerned with actually doing the action in the present. A second definition of pondering (adjective) is "deeply or seriously thoughtful." So, it would not be unreasonable to assume the pondering (noun) would refer to "an act of thorough, deep, and careful reflection." And I know adding an "s" makes nouns plural. So, there it is. Teaching is all about being thorough and careful, reflecting and being thoughtful on your feet. And a bit of improv. It appears the term is catching on, as evidenced by the 4378 blog posts tagged "Ponderings" on Technorati.